Many bloggers are making their blogs multi-author blogs these days. In this way they are inviting guest authors to write articles for their blogs. This is a best idea for one to show their creativity on most reputed blogs and it also gives a link back to the author of the article. If you are also going to start guest blogging on your blog, I’ll suggest you to start a revenue sharing program. In revenue sharing program, author of the article can use his/her own ads along with his article. This will attract more guest bloggers for your blog. And if you are using WordPress you can automatically rotate ads based on the author of the article using a wordpress plugin called as AdShare. AdShare will auomatically roate ads based on the author of the current post. 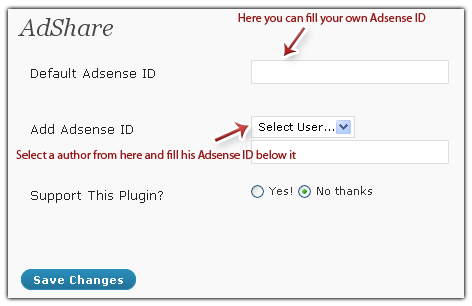 Once installed, you can assign Adsense IDs to each author from settings page of AdShare. You should use WhyDoWork Adsense plugin if you want to put adsense ads on your blog. Its easy to use plugin. BTW I’m not using any plugin on my blog. I put all the codes manually here. I ask only one question that how much we can earn from google adsense from our blog and if you don’t mind please tell us how much earn from your this blog in one month. Its not a fixed amount that you can earn from Google Adsense. Earnings from Google Adsense depends mostly on your traffic and how you optimize your adsense units. More the traffic you have, more will be your earnings. People are making huge amount of money from Google Adsense.